This is the sixth installment of the Impact series, #SocialGoodStars. The people highlighted here are passionate, dedicated philanthropists, strengths to their communities, and social media masters. They also happily share their vast knowledge with others, making them shine as leaders in the Social Good world. You can read the fifth interview with LinkedIn’s Meg Garlinghouse here. The internet has opened many doors, and Craig Newmark was one of the first entrepreneurs to help open them and start making a difference, back in 1995. Craig is the founder of Craigslist, the web-based platform where people can help each other with everyday needs. It is now one of the 10 most-visited English language web platforms, serving every continent on earth (except Antarctica). Craig has devoted much of his life to the philosophy that we all need to help one another, and has taken it to new levels via his philanthropy. He is devoted not only to making a difference, but to helping others make a difference, too. 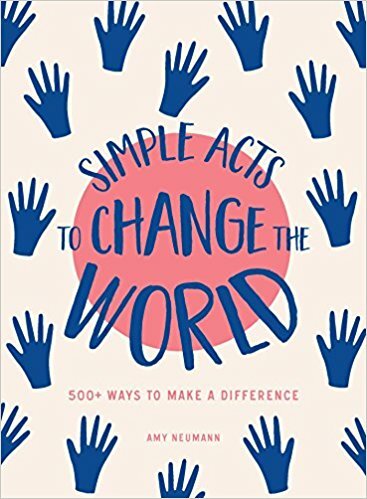 In March 2011 Craig launched Craigconnects, his initiative to link up everyone on the planet using the Internet to bear witness to good efforts and encourage the same behavior in others. Craigconnects seeks to support technology and platforms that enhance connectivity, help more people and organizations do good in the world, and improve and ensure media integrity. Craigconnects evolved from Craig’s many years of personal involvement with nonprofit organizations and issues he considers vital. He serves on the board of directors for 3 nonprofit organizations, advisory boards of 11 others, and provides personal or financial support to dozens more who use the internet to help solve social issues, provide for America’s returning veterans, drive funding for school projects directly to the classroom, or help government agencies and groups with innovation initiatives. And he happily admits, although he no longer wears a plastic pocket protector and thick black glasses that are taped together, he is still a nerd. Which is a good thing for all of us, and for social good: Read on to learn why. Craig Newmark, Craigslist founder and founder of the nonprofit Craigconnects.org. Photo courtesy of Stephanie Canciello, unali artists. You founded Craigslist 17 years ago with the philosophy to serve the community, help one another, keep the internet free, and treat people the way you want to be treated. How have these ideas shaped your philanthropic efforts? That philosophy is pretty much ingrained in me, I guess it’s my Sunday School days talking. That also includes that I should do a better job at being my brother’s, and sister’s keeper. Over the last decade, I started getting serious about that, supporting nonprofit and related groups, people with boots on the ground, people who actually get stuff done. They tell me they need help with social media, both consulting and actual practice. Specifically, I figure I got a bit of a bully pulpit, which I need neither for my business or self, so I dedicate that position to the efforts which need a hand. (Strictly speaking, I’ll also use it for my own entertainment, like posting the results of my pseudo-birdwatching). 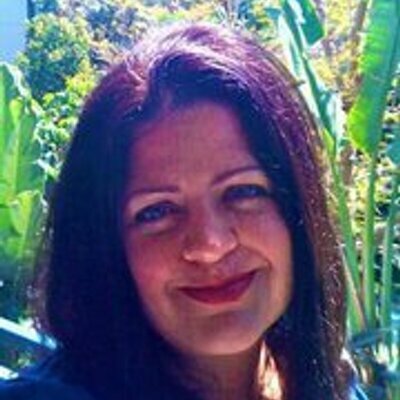 The mission of your nonprofit craigconnects.org is “Using technology to give the voiceless a real voice and the powerless real power.” Can you share your ideas on how things like mobile, faster internet connections, social media, and other technology changes are morphing the landscape of philanthropy? What are some ways nonprofits and causes can benefit? The Internet is becoming an everyday part of our lives, not only when we’re in front of our desks, but all the time. Mobile tech is making the Net ubiquitous in all manners. People are using the Net in many forms to encourage people to work together for mutual good, sometimes like helping each other get through the day. One trend in that direction is “collaborative consumption” like various car-sharing services. The proliferation of such efforts is noticed by people of good will who start to realize that often many good charities get stuff done in redundant ways. That is, even I notice that more than one philanthropic organization does the same thing as others. As we notice that effect, well, we start to expect that similar orgs will cross silos and work together. That’s called the “sea of goodwill” in the military families and veterans community, with some unity arising via the National Resource Directory, nrd.gov. Similarly, groups helping in the voter protection effort come together in the Voter Protection Coalition. One side effect is that even the more well-intended but naive folks, like me, see that there are fake nonprofits who tell a good story, but don’t get results. That’s being addressed by groups including Charity Navigator, GuideStar, and GreatNonprofits.org. I don’t feel the bogus efforts will survive this trend, but it’ll take a while. 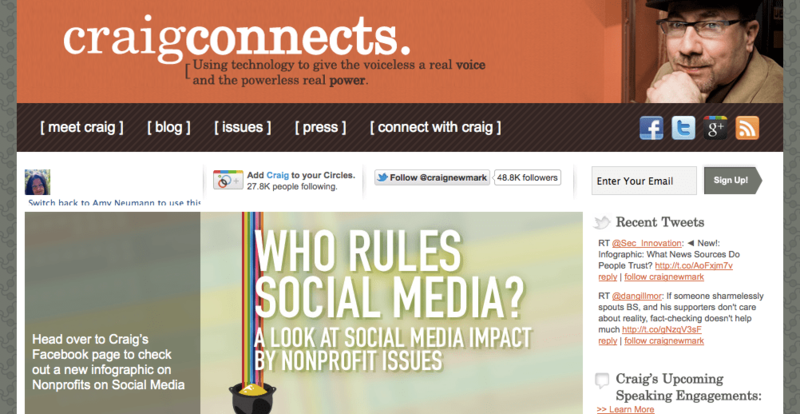 With Craigconnects.org, you’re working on making positive changes in some key areas: Military Families and Veterans, Back-to-Basics Journalism, Public Diplomacy, Open Government, Consumer Protection, and Technology for Good. Can you talk about that? Some efforts have emotional appeal for me, like regarding military families and veterans; I figure if someone’s willing to take a bullet defending me, I should do something. Similarly, I feel an ethnic connection to issues involving the Middle East. Other areas involve the survival and success of the American democracy. I like to say that “the press is the immune system of democracy” and I’d like to make that real again, via the preservation of factchecking, etc. Another area is the preservation of everyone’s voting rights, hence working with voter protection groups. You are very engaging and personally involved across many social media platforms. How do you work that into your busy schedule, and what effect do you think it has on your philanthropy efforts? Well, whatever needs to get done, I just do what it takes. I understand that people take “time off” or “vacations” which I don’t get. Might have something to do with “having fun” which is also a mystery to me. If you could suggest a couple things to individuals who want to make a difference, what would they be? Volunteer for efforts they believe in, nonprofit, political, or whatever. That could involve real life, offline work, or cash contributions. It can also involve social media. Expressions of support really mean something, including original posts, or Facebook likes, or Twitter retweets. Even better, active sharing to one’s social graph, that really helps. The best way to reach Craig is through the craigconnects website. 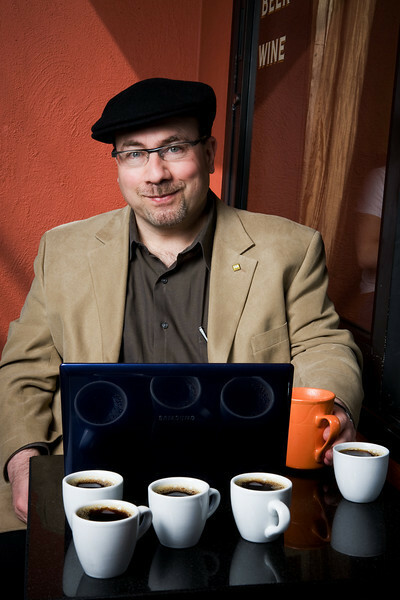 Or connect with Craig via Facebook, @craignewmark on Twitter, or on Huffington Post.